A hidden jewel and an affordable outing. Graue (Pronounced Gr-ow-ee) Mill will take you back to the days of kitchen bathtubs, homespun cloth, and mill ground grain. 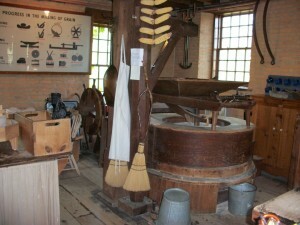 Located along Salt Creek in Oak Brook, the mill first began turning in 1852 and for 70 years farmers were able to bring their grain to this custom mill to have their grain turned into flour or meal. Fred Graue would keep a portion as payment for his services, and you can still see how it all took place today. On the main floor you will find a small gift shop and the main grinding area. They ground some corn into a coarse cornmeal for us to touch, and it is available for purchase as well. My daughter got to participate in the process and enjoyed the hands-on experience of removing kernels from the cob the way they did it before combine harvesters came along. 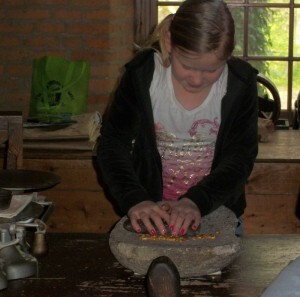 She also tried her hand at hand grinding to help demonstrate how much easier the mill made the farmer’s job. The mill is run by electricity today, but it doesn’t detract from the authentic feel of the place and the understanding you take away with you of how a real water mill worked. 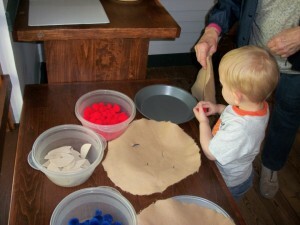 Other tasks that kids can observe and/or participate in include carding wool, playing checkers with corn cob pieces, making pretend pies with pieces of felt and puffy balls that look like cherries and blueberries as well as pretend apple wedges. My toddler especially enjoyed those. Kids can dress up, try their hand at ironing (with a cold iron), watch the loom in action, and learn about life over a hundred years ago. The museum portion is small, but well packed with artifacts and information that kept my kids’ interest. We have been to many similar demonstrations and they have all carded and spun wool before, but the one-on-one attention at Graue was a special experience anyway. If your kids haven’t done these activities before, this is a great personalized introduction to it. In the basement you will find the underworkings of the mill and a small area dedicated to the other function of the mill — as a stop on the underground railroad. Pictures and artifacts found there would be a great supplement to a study on this era as well. Getting there: 3800 York Road Oak Brook, Illinois 60523. Just 18 miles from the heart of Chicago, the Mill is on York Road, 1/4 mile north of Ogden Avenue, at the junction of York and Spring Roads. Cost: The mill is one of the sites available through the Museum Adventure Pass, so be sure to stop by your library for 2 adult and 2 kid passes before heading to the mill. When to go: It is good to call and make sure you are not arriving at the same time as a prescheduled field trip. While it can be fun to tag along, a larger group can pretty well fill the place and make it difficult for you to see much of anything. They will be happy to share their other field trip times with you. We arrived when they opened and had the place pretty much to ourselves until 11:30 when 150 kids arrived. However, they said they do sometimes have field trips scheduled for at or before their regular opening time, so it would be best to call first. Also, they said mornings tend to be better as the demonstrators aren’t always there all day, so be sure to ask about that when you call as well. Because we arrived just before a group we were able to enjoy the three docents on hand that day. They really added to our enjoyment of the visit. Other tips: Parking is on the other side of York Road from the mill. You will turn South off of York, but then take the foot bridge under the road to get to the mill. It is a small, but tall building with four floors. The museum is not spacious and so is not stroller friendly. We just left ours outside during the hour and a half we were enjoying the displays and demonstrations. If you have extra time, enjoy the trails and head up to the nature center in Fullersburg Woods. Beautiful area and lots of wildlife to enjoy as well. Pack a picnic lunch if you would like and make a longer day of it. We really enjoyed our outing to the mill, and it was a great meetup with my parents as well. I always enjoy mixed ages on a field trip as we all bring such a different perspective to historical observations. Definitely find a day on your calendar soon to enjoy the rich history of this quaint mill. Watch Harold Davis give a sheep a haircut. 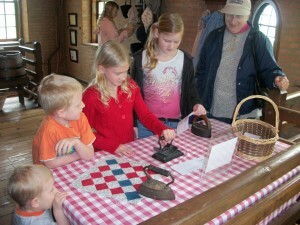 Talk with our volunteers about the old-time crafts of spinning and weaving. Try your hand at the drop spindle and find out the benefits of joining our team of dedicated volunteers. Free Admission to a Public Garden Homeschool Trampoline Time!